Spruce damage becomes evident in late May, when new growth on the branch tips develops into cone-shaped galls. The galls are swellings about 5 cm long, and they contain hundreds of adelgids feeding on sap. Initially the galls are green; later they turn reddish purple and dry out. Old, vacated galls have mouthlike openings and stunted, needlelike projections and are reddish brown. 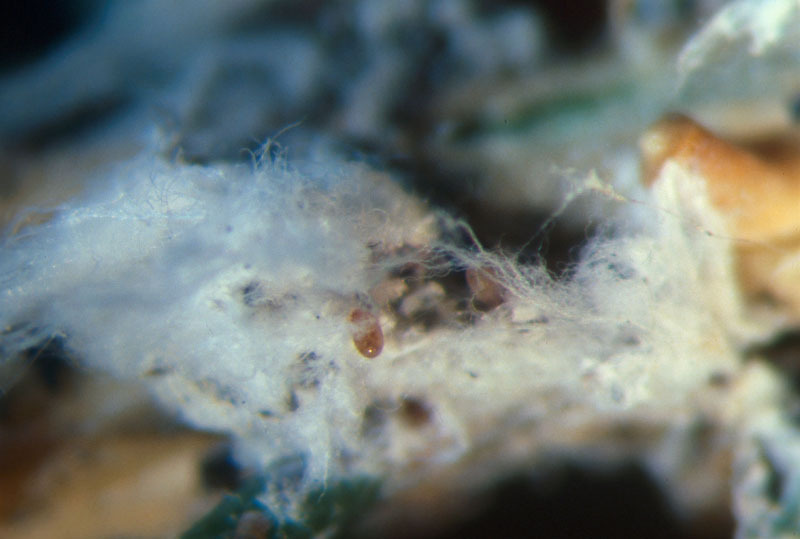 The presence of the Cooley spruce gall adelgid is also indicated by white cottony specks (flocculence) that appear on affected trees in the spring and summer. During heavy infestations the flocculence (produced by the female adelgid as a protective cover for her eggs) can cover an entire tree. The adelgids also feed on needles during one portion of their life cycle, which can cause the needles to dry out and fall off. Damage is mainly cosmetic: old galls remain on the branches for 2–3, years, making trees somewhat unsightly. If gall formation is heavy, growth and vigor may be reduced, but trees are rarely killed. On spruce, the typical damage is the unsightly, cone-like galls formed on the tips of the new growth. 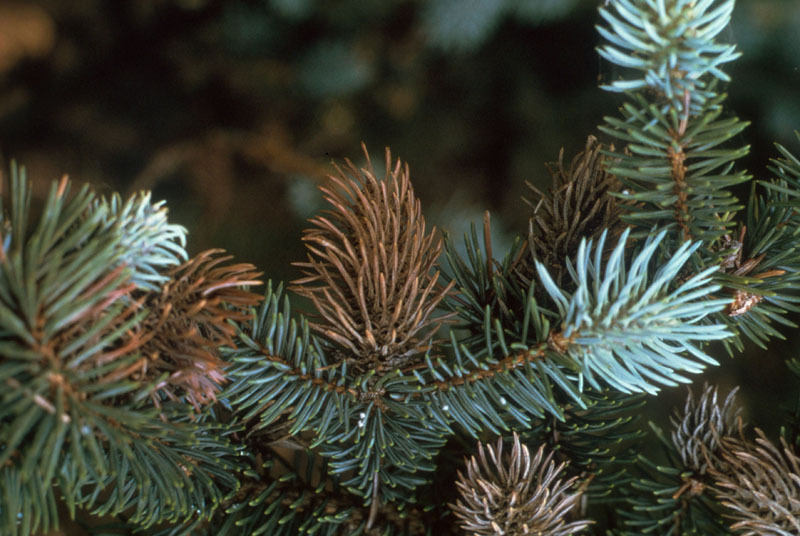 On Dougles-Fir , the aphids cause discoloration and distortion of the new foliage, which can be of economic importance. 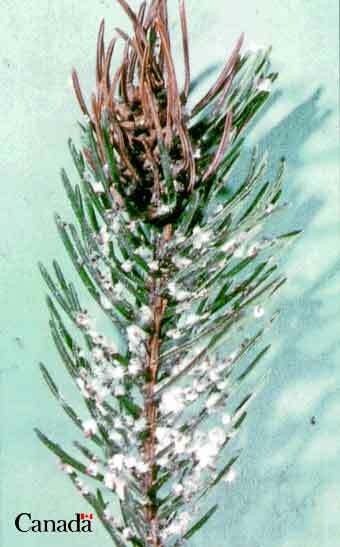 Douglas-fir is the alternate host of the Cooley spruce gall adelgid, although its presence is not essential for the buildup of large populations. 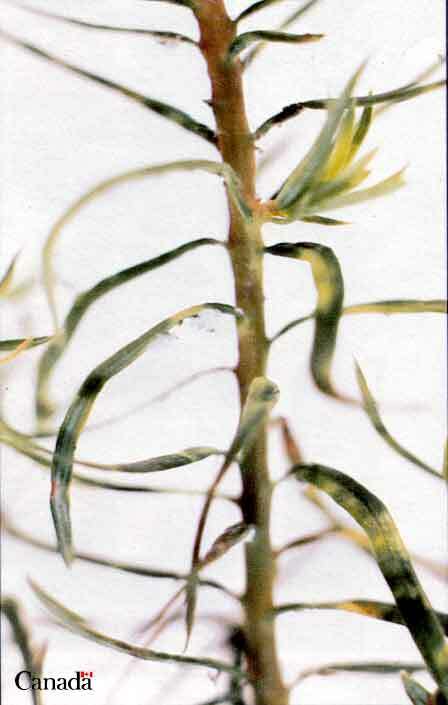 Flocculence is also evident on Douglas-fir, along with a yellowing of foliage that can lead to premature needle drop, but there is no gall formation. In general, aphids are small, gregarious insects with soft, pear-shaped, green, yellow, black or colorless bodies. Their long, slender legs allow for slow movement. Most species possess "cornicles" a pair of tube-like, truncate, or porelike structures on the dorsal, posterior section of the body. Adults may be wingless or have four transparent, delicate wings. The complete, 2-year life cycle of the adelgid includes an alternation of generations between Douglas-fir and a spruce species; however, the insect is capable of surviving on either species when the other is not present. The complete life cycle begins in the summer with winged females leaving Douglas-fir to migrate to spruce. There the insects reproduce without mating (parthenogenetic reproduction), and lay eggs that hatch into small, wingless male and female adelgids. These insects then mate, and the females lay their eggs on spruce. Emerging nymphs feed on the spruce needles and in the fall move to stem tips, just below the buds, where they overwinter. 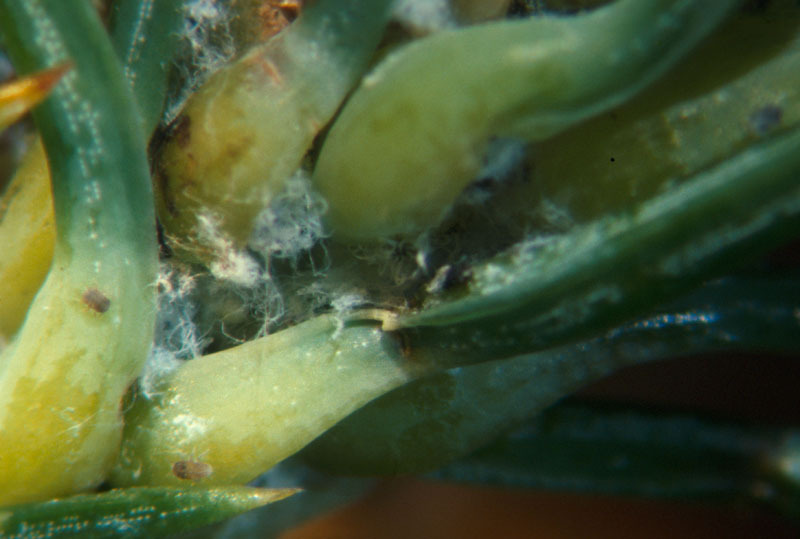 The nymphs hatching from these eggs overwinter on the lower surfaces of needles and complete their development in the following spring on the Douglas-fir, before moving to spruce and restarting the life cycle. In the following spring the nymphs complete their development, and each parthogenetic female lays about 200 eggs. Nymphs emerging from these eggs move to new growth to feed, causing the formation of galls. At the beginning of the second year, in the summer, winged parthenogenetic females emerge from the galls and migrate to Douglas-fir to lay eggs. 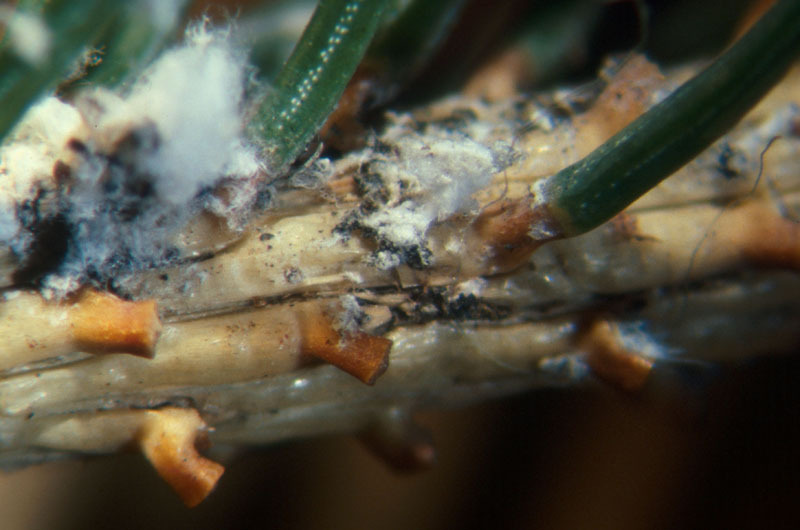 The Cooley spruce gall adelgid has very few natural enemies, a factor that may necessitate some form of direct control when populations are high. 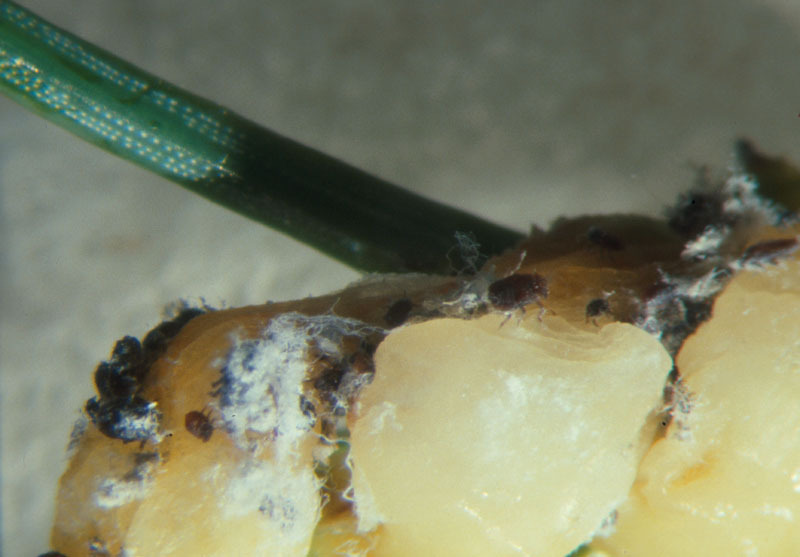 Aphid damage usually does not occur until populations are large; however, population build-up can be fast and erratic. Predicting aphid outbreaks is difficult in nurseries, but the presence of wasps or ants is a good indicator of aphids. Wasps feed on both honeydew and aphids, and can effectively control small populations. However, it is virtually impossible to exclude aphids from the nursery, as they are frequently blown in by the wind. All these factors justify waiting until populations have been detected before controls such as insecticidal soaps or insecticides are applied. The probability and intensity of A. cooleyi outbreaks may be decreased by excluding spruce in windbreaks or the nursery periphery adjacent to Douglas-fir seedbeds. Sap-feeding : Feeds on plant sap. Piercing-sucking: Has specialized mouthparts for sucking the fluids from plants, thereby causing deformities or killing the affected plant sections. The Cooley spruce gall adelgid is a species of aphid that colonizes various spruces across Canada, but is most abundant in the west. In the Prairie Provinces its primary hosts are white, Engelmann, and blue spruces. Douglas-fir is an alternate host when growing in the same stands as spruce. Ornamental and shelterbelt trees are affected, as well as those naturally occurring in forest stands.